The last few years have been a roller coaster ride for vocational education and training in Australia. Despite the hard work and good intentions of RTOs, a combination of systemic issues like funding and scandal have left VET focused on challenges, not opportunities. That’s why VETtrak stepped in with the Voice of VET RTO Industry Australia 2018 Report. A first in what is anticipated to be an annual series taking the pulse of the market, we polled 444 RTOs across Australia to discover the opportunities, as well as the challenges. The desire was to give RTOs a rare chance to speak, rather than being spoken about. What it has revealed is promising for the future. While there are a series of challenges RTOs are grappling with, it is clear that – as far as our respondents are concerned – the opportunities are there for RTOs willing to think big about our industry’s future. It will be no surprise RTOs, like any industry in Australia, are facing a number of pressure points over the next 12 months. The biggest of these – attracting new enrolments – was considered a pressure point by 40% of the RTO market – by no means a small number. However, what is a unique challenge for our market is the second largest pressure point identified by Voice of VET struck at the industry’s heart: the reputation of the VET itself. For some time now, it’s true VET has been facing a difficult image problem. Thanks to ongoing relative declines in public funding and stubborn community perceptions of VET is a second choice for students, it’s foundations have over time been tested. When you add to this VET-FEE-HELP episode – and the ongoing associated negative media coverage – it’s not difficult to see why 39% of the market sees this as a pressure point. Voice of VET reflects how deeply this crisis has affected not only the way the community views the sector but the way the sector sees itself. Rather than brushing off this issue and putting it firmly in the past, the industry is still very much in the process of healing. Out of all administrative and business challenges, Voice of VET found keeping on top of compliance topped all the rest. Nominated by 36% of RTOs as their biggest challenge, it garnered four times as many votes as staffing (the major concern for just 10% of RTOs). The good news is that, despite the storm clouds, the majority of RTOs see a silver lining. For a start, the majority of RTOs we surveyed were bullish about their future prospects. At the time they were surveyed, 63% reported that business was as good or better than in the previous year, and only 26% actually saw their revenues decline during that period. Looking forward to the next 12 months, Voice of VET found a huge 78% expect revenues to be as good or better than the previous 12 months, and only 9% expecting revenue declines. That’s a strong vote for both the resilience of the sector and the value it provides students. So where were the opportunities that they identified for 2019 and beyond? It was clear that a quarter of the market had its eyes on expansion. Fifteen percent of respondents had identified new markets – including international, rural or interstate – and growth in general through marketing as a prime opportunity for the next 12 months. Another 10% were looking at increasing the diversity of courses on offer to students, to either add entirely new products to their suite or expand the scope of existing products. Together, RTOs voted student enrolment numbers, student acquisition strategies and the amount of employee training or coaching as the biggest drivers of progress of their RTO when compared with the rest of the market over the next 12 months. 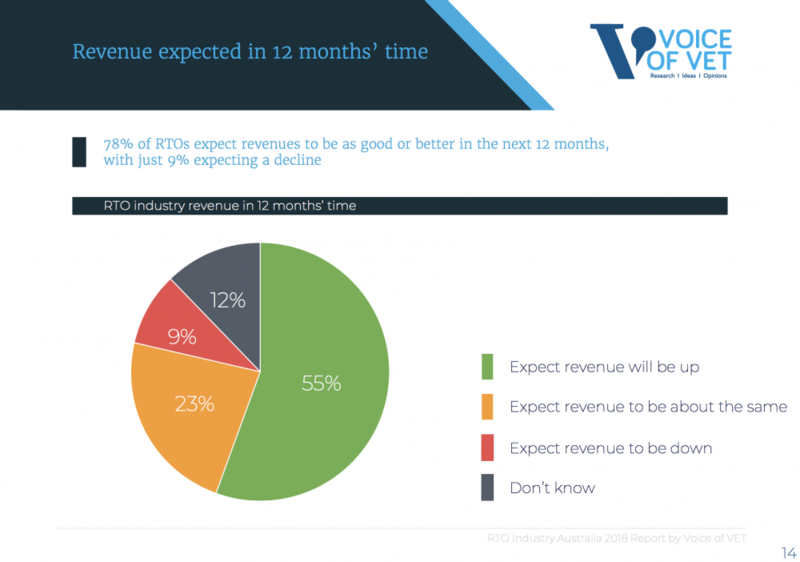 When taken together, the challenges and opportunities detailed by the Voice of VET report paint a detailed picture of the ‘state of play’ in Australia’s RTO market heading into 2019. 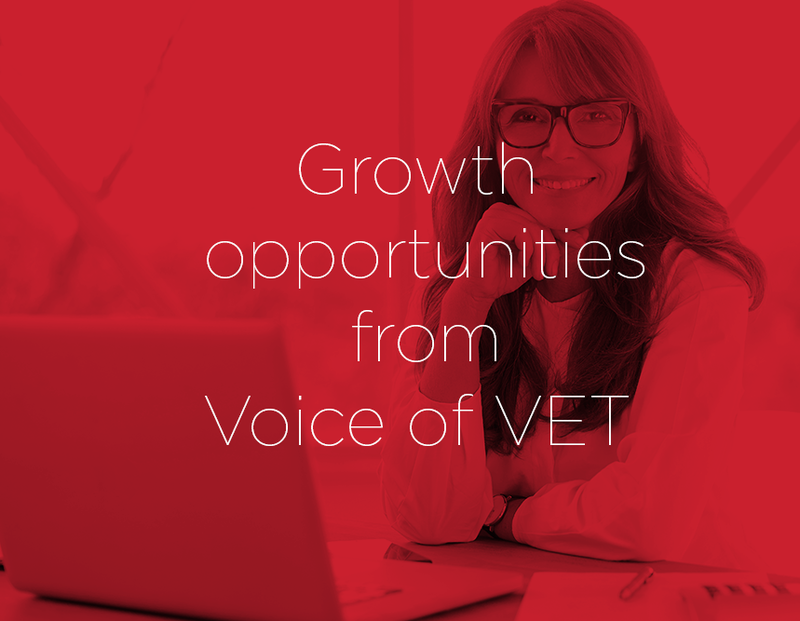 It’s clear to us at VETtrak that the opportunities for business growth that come by aligning RTO strategy with the current and future demand of our most important stakeholders – our students – outweigh the challenges that we face as a sector in the year ahead. As long as the market embraces a ‘growth mindset’ – which according to Voice of VET is held by 62% of respondents – we’re sure that vocational education will make the new year count.